How do you help increase the quality of education in Indonesia? Well, if you’re Citibank, (disclosure: they are our clients and we helped in this project) one way is to help set up a forum where teachers can help themselves, learn from each other and discus ideas. And this was what Citi did in conjunction with their NGO partner, HOPE Indonesia. 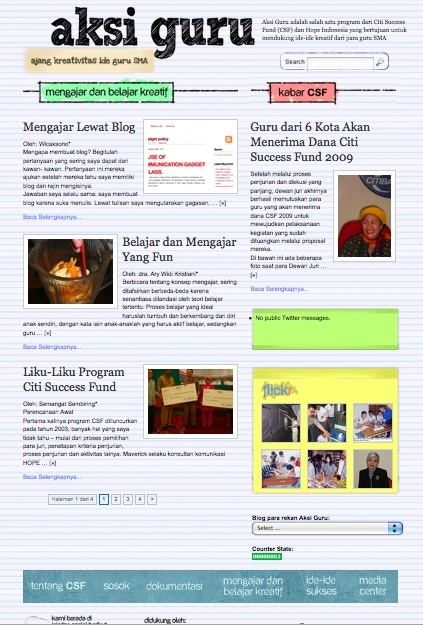 Yesterday, as part of their Corporate Social Responsibility efforts under the Citi Peka unbrella, Citi among other things launched the website aksiguru.org that it says is probably the first of its kind in Indonesia aimed at supporting teachers’ peer-development and student outreach. “We hope to boost teachers peer development by launching the Aksiguru.org website,” said Charles Ham, Country Director Yayasan Hope Indonesia. “The use of internet and social media as a means for widespread communication is remains relatively low among teachers in the country, and we hope to generate teachers’ interest and eagerness in sharing their creative teaching methods with others though this site,” he continued. As with so many sites utilizing social media these days aksiguru.org also uses Twitter and Facebook to amplify its messages. From the response so far, it looks like teachers are taking to this new form of cooperation, co-learning and collaboration.